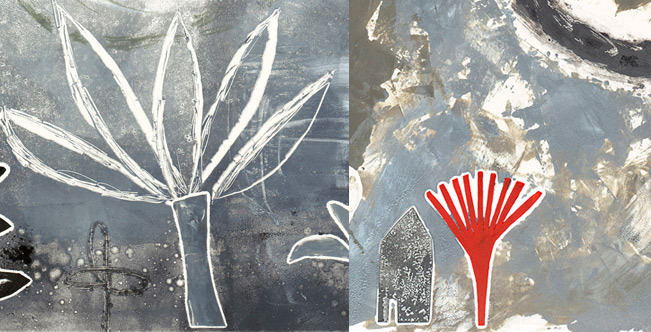 Details from two monotypes currently on display at the South Shore Art Center. Looking for affordable art? Visit the group printmaking exhibit entitled Under Pressure now on display upstairs in the Crossen Gallery (a hallway really..) outside the printmaking studio at the South Shore Art Center. Artists are always seeking ways to connect with their audiences in ways that may not be a traditional route. Two of my favorite movies are Beautiful Losers and Exit Through the Gift Shop. Both illustrate how artists’ work are validated in unconventional ways. Barry McGee, one of the artists featured in Beautiful Losers, currently has a more conventional exhibit venue at the ICA in Boston that inspires the viewer to appreciate art with a sense of humor and originality that supports the concept of taking a unique path to success. The Under Pressure exhibit at the SSAC in Cohasset, MA runs until further notice. Artwork is for sale directly through the artists without a commission fee. No frills, just art. You are currently reading alternative exhibition space at donna ingemanson studio.